(Left to Right) Shane (guitar/vox), Andy (guitar/vox), Ben (drums), Mark (bass/vox). HAGGIS started out of boredom in the summer of 1991. The original line-up was Mark on bass, Shane on Guitar, Andy on Drums, and Paul (ex-Septic Death) on Guitar. 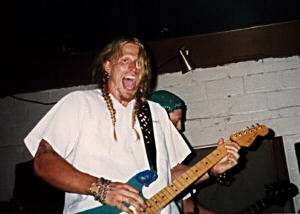 Paul quit the band in 1993, and Andy moved to guitar. We found Ben at a local music store, where he lied to us about his age, and let him join. Turns out he was only 15. But, he ruled on drums, so we kept him. (The rest of us are all in our mid/late-20s). Haggis pretty much called it quits after Mark moved to Santa Cruz in 1997. They played one show at the house of rock in 1998, but that is it. Andy moved to NYC to seek fame as a recording engineer a couple of years ago, and Ben moved to NYC to live in a "deluxe apartment in the sky" early in 2001. Shane is still living in Boise, where he does vocal duties for the Gordie Howe Trio Unit. I had to type up a bunch of our lyrics for our german 10". I figured, what the heck, why not put them online. Here they are. Can You Stomach Us? Cassette (1991 Zentrum) - Now available as mp3s. The Traitors Live Cassette (1992 Zentrum) - Now available as mp3s. SL9 - The final Haggis recordings, released in mp3 format - Available here. If you want more info about Haggis, mail me and I'll tell you more than you want to know. Return to the Boise Punk Page.